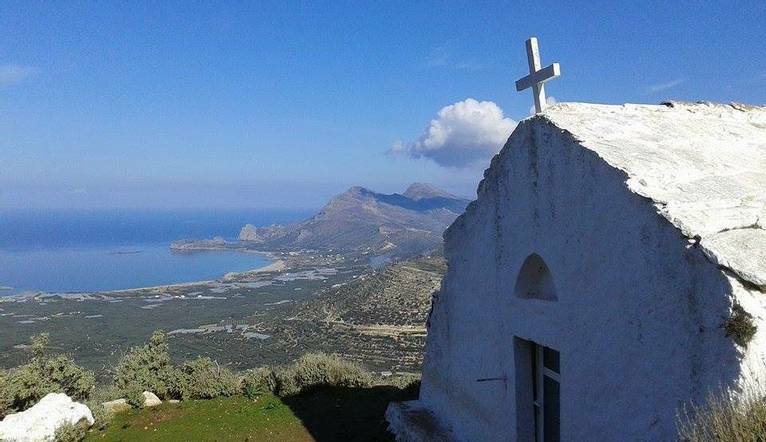 Join us as we discover the beautiful north-western region of Crete on our walking holiday. With 4 lovely included walks, we can enjoy the island’s stunning scenery, delicious cuisine and warm hospitality. This holiday ticks all the boxes for walkers: breathtaking views and delightful walks during the day, time to take a dip in the afternoon, and sociable taverna dinners with delicious Cretan food in the evenings. Based in the unspoilt coastal town of Kastelli-Kissamos we’ll receive a warm welcome from our host, Stelios. They have put together a varied selection of walks through some of Crete’s iconic gorges, which provide spectacular scenery as well as welcome shade from the sun. This is some of the finest walking in Europe – so don’t forget your camera! The small village of Agia Irini is located in a valley along the winding road that leads from Chania to Sougia in southwest Crete. Smaller than Samaria but no less impressive Agia Irini is a peaceful and stunning gorge walk culminating with time on the South coast for lunch and a swim. We walk down one gorge and up another on this shaded and secluded circular walk with stunning scenery from start to finish. We end with lunch at the beautiful botanical gardens in the foothills of the White Mountains. Today we take in 2 impressive gorges, small churches, beautiful old frescoes and delightful little villages. The gorges are also home to the impressive Griffon vultures which we are sure to see, and at certain times of the year, stunning black Dragon Lillies. A real highlight of the week is the visit to Stelios’ parents house where a Cretan welcome awaits. Before this we begin our walk up to the mountain eco village of Milia and then through the beautiful Sirikari gorge. We round the walk off with an excellent taverna lunch sitting under the grapevines and enjoying wonderful views back to the Sirikari gorge. One evening we take a trip via shuttle bus to the beautiful Venetian harbour town of Chania to enjoy a delicious meze meal in the well known and atmospheric Elas taverna. The transfer time from Chania Airport to the hotel takes approximately 45 minutes, depending on weather and traffic. Four guided walks are included in the programme. Your walking guide will advise you in resort of the daily programme. The walking programme is graded as Medium and you can expect to walk between 6 to 12km per day, with some ascents/descents, rough underfoot terrain and high altitudes involved.